Click here for the readings of this coming Sunday! This year too, we are meeting for a real family celebration, the Baptism of 13 children in this wonderful Sistine Chapel, where with their creativity, Michelangelo and other outstanding artists achieved masterpieces that illustrate the wonders of the history of salvation. I would like immediately to greet all of you present here: the parents, the godparents, the relatives and friends who accompany these newborn babies at such an important moment for their lives and for the Church. Every child who is born brings us God's smile and invites us to recognize that life is his gift, a gift to be welcomed with love and preserved with care, always and at every moment. The Christmas Season, which ends precisely today, has made us contemplate the Child Jesus in the poor grotto of Bethlehem, lovingly tended by Mary and Joseph. God entrusts every child who is born to his parents: so how important is the family founded on marriage, the cradle of life and love! The House of Nazareth where the Holy Family lived is the model and school of simplicity, patience and harmony for all Christian families. I pray the Lord that your families too may be welcoming places where these little ones can not only grow in good health but also in faith and love for God, who today, with Baptism, makes them his children. The Rite of Baptism of these children is taking place on the day in which we celebrate the Feast of the Baptism of the Lord, an event which, as I said, brings the Christmas Season to a close. So far, we have heard the account of the Evangelist Luke, who presents Jesus who remained hidden in the crowd while he went to John the Baptist to be baptized. Jesus had also been baptized, and, St Luke tells us, "was praying" (3:21). Jesus speaks with his Father. And we may be certain that he did not only speak for himself but also of us and for us; he also spoke of me, of each one of us and for each one of us. And then the Evangelist tells us that above the Lord in prayer, Heaven was opened. Jesus entered into contact with the Father, Heaven opened above him. At this moment we can think that Heaven has also opened here, above these children of ours who, through the Sacrament of Baptism, come into contact with Jesus. Heaven opens above us in the Sacrament. The more we live in contact with Jesus in the reality of our Baptism, the more Heaven will open above us. And from Heaven -- let us return to the Gospel -- that day a voice came which said to Jesus: "You are my beloved Son" (Lk 3:22). In Baptism, the Heavenly Father also repeats these words for each one of these infants. He says: "You are my child". Baptism is adoption and admission into God's family, into communion with the Most Holy Trinity, into communion with the Father, the Son and the Holy Spirit. For this very reason, Baptism should be administered in the Name of the Most Holy Trinity. These words are not merely a formula; they are reality. They mark the moment when your children are reborn as children of God. From being the children of human parents, they also become the children of God in the Son of the living God. However, we must now meditate on the words in the Second Reading of this liturgy where St Paul tells us: "He saved us, not because of deeds done by us in righteousness, but in virtue of his own mercy, by the washing of regeneration and renewal in the Holy Spirit" (Ti 3:5). A washing of regeneration: Baptism is not only a word, it is not only something spiritual but also implies matter. All the realities of the earth are involved. Baptism does not only concern the soul. Human spirituality invests the totality of the person, body and soul. God's action in Jesus Christ is an action of universal efficacy. Christ took flesh and this continues in the sacraments in which matter is taken on and becomes part of the divine action. We can now ask precisely why water should be the sign of this totality. Water is the element of fertility. Without water there is no life. Thus, in all the great religions water is seen as the symbol of motherhood, of fruitfulness. For the Church Fathers, water became the symbol of the maternal womb of the Church. Christian writers were already saying, unless he has the Church as mother. We perceive in a new way that Christianity is not merely an individual, spiritual reality, a simple subjective decision that I take, but something real and concrete, we could also say something material. Adoption as children of God, of the Trinitarian God, is at the same time being accepted into the family of the Church, it is admission as brothers and sisters into the great family of Christians. And only if, as children of God, we are integrated as brothers and sisters into the reality of the Church can we say "Our Father", to our Heavenly Father. This prayer always implies the "we" of God's family. 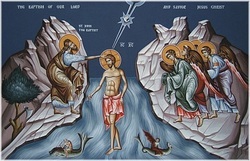 Now, however, let us return to the Gospel in which John the Baptist says: "I baptize you with water; but he who is mightier than I is coming ... he will baptize you with the Holy Spirit and with fire" (Lk 3:16). We have seen water; but now the question is unavoidable: of what does the fire that St John the Baptist referred to consist? To see this reality of the fire, present in Baptism with water, we must note that John's baptism was a human gesture, an act of penance, a human impulse for God, to ask the forgiveness of sins and the chance to begin a new life. It was only a human desire, a step towards God with their own effort. Now this is not enough. The distance would be too great. In Jesus Christ we see that God comes to meet us. In Christian Baptism, instituted by Christ, we do not only act with the desire to be cleansed through the prayer to obtain forgiveness. In Baptism God himself acts, Jesus acts through the Holy Spirit. In Christian Baptism the fire of the Holy Spirit is present. God acts, not only us. God is present here today. He takes on your children and makes them his own. But naturally, God does not act in a magical way. He acts only with our freedom. We cannot renounce our freedom. God challenges our freedom, invites us to cooperate with the fire of the Holy Spirit. These two things must go together. Baptism will remain throughout life a gift of God, who has set his seal on our souls. But it will then be our cooperation, the availability of our freedom to say that "yes" which makes divine action effective. These children of yours, whom we will now baptize, are not yet able to collaborate, to manifest their faith. For this reason, your presence, dear fathers and mothers, and yours, dear godfathers and godmothers, acquires a special value and significance. Always watch over your little ones, so that they may learn to know God as they grow up, love him with all their strength and serve him faithfully. May you be their first educators in faith, offering together with your teaching also the examples of a coherent Christian life. Teach them to pray and to feel as living members of the concrete family of God, of the Ecclesial Community. The attentive study of the Catechism of the Catholic Church or of the Compendium of this Catechism can offer you important help. It contains the essential elements of our faith and can be a particularly useful and immediate means, for you yourselves, to grow in the knowledge of the Catholic faith and to transmit it integrally and faithfully to your children. Above all, do not forget that it is your witness, it is your example, that has the greatest effect on the human and spiritual maturation of your children's freedom. Even caught up in the sometimes frenetic daily activities, do not neglect to foster prayer, personally and in the family, which is the secret of Christian perseverance. Let us entrust these children and their families to the Virgin Mother of Jesus, Our Saviour, presented in today's liturgy as the beloved Son of God: may Mary watch over them and accompany them always, so that they can fully carry out the project of salvation which God has for each one. Amen.